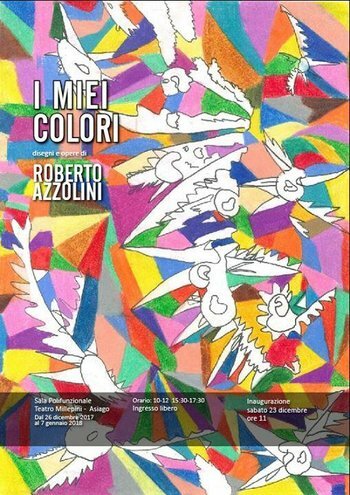 Opening Saturday 23 December 2017 11 a.m.
Saturday 23 December 2017, at the sala polifunzionale Millepini of Asiago, there will be the inauguration of the art exhibition "my colors" by Roberto Azzolini, with the participation of children of primary school Monte Ortigara of Asiago. Within the Show, which will be open from December 26 to January 2017 2018 7, you can see the designs and artworks by this artist. Roberto Azzolini is a disabled young man with autism of plateau, which has demonstrated a particular artistic skill. His works are colorful and lively, inspired by the flora and fauna of the plateau.